Nearly four times as many U.S. troops died in training accidents in 2017 than in combat. This statistic, which showed 80 service members killed during training accidents versus 21 service members killed in combat, isn’t just a one-year blip. In fact, accidental deaths have exceeded combat deaths each year since 2015, according to Rep. Mac Thornberry (R-Texas), chairman of the Armed Services Committee. He cites 185 service members lost in fatal, noncombat accidents from 2015 to 2017, compared to 44 military personnel who died in combat during that period. A number of fatalities stemmed from aviation mishaps, including 25 deaths this past spring, according to the NDAA. A study by the independent Military Times website found that in the past five fiscal years, 133 troops have died as a result of aviation training incidents and reports a rise of 40 percent in accidents from 2013 to 2017, although not all mishaps resulted in deaths. The data was based on Freedom of Information Act requests to the Naval Safety Center, the Air Force Safety Center and the Army Combat Readiness Center. It’s important to keep those numbers in context, says Hope Seck, managing editor of independent site Military.com. She notes there are 1.3 million active-duty troops and fewer than 200,000 are deployed. “If you took a time machine back to 1994, you could easily say more troops were dying in training than in combat in those days, because there was no combat,” says Seck, who has covered the defense sector since 2009. These days, money may be a factor in the uptick in fatalities, given the Pentagon budget cuts that began in 2013. A Military Times study found that the amount of time logged aloft by U.S. manned warplanes decreased by 170,000 hours from 2013 to 2017, which means pilots aren’t flying the same number of training hours as in years past. A big part of the problem: planes grounded for repairs, with inadequate funds to fix them or to retain mechanics to handle the work. So when the planes do get in the air, the pilots flying them or training in them have logged fewer hours overall. Training deaths extend to other branches of the U.S. military as well. Last year was an especially bad one for the Navy, at least in the Pacific. In June, the guided-missile destroyer USS Fitzgerald was wrapping up a long day of training when it collided with a 730-foot container ship off the coast of Japan, killing seven sailors. Following a naval investigation, the destroyer’s commanding officer, executive officer and senior enlisted officer were relieved of their duties on the vessel. 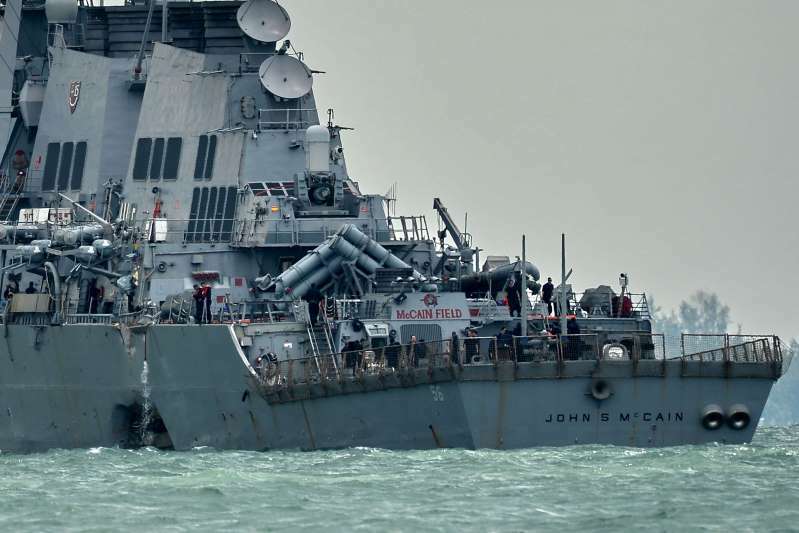 Then, in August, the destroyer USS John S. McCain collided with a 600-foot tanker en route to Singapore, resulting in the death of 10 sailors. The commanding officer was subsequently removed from duty, as was the executive officer, who displayed “poor leadership of the ship’s training program,” according to a statement issued by the Seventh Fleet in Yokosuka, Japan. Following the twin mishaps, the Navy launched two wide-ranging investigations. The Navy’s own analysis, according to the NDAA, found ”fundamental failures to responsibly plan, prepare, and execute ship activities and to avoid undue operational risk,” calling out readiness yet again. So, when it comes to training fatalities, how does the U.S. stack up against other countries? Drawing these comparisons can be tricky — some statistics include only training and exercise fatalities; others include suicides, disease and off-base vehicular accidents as well. But a March 2018 report from the U.K. Ministry of Defense found that 141 members of British armed forces — both regular personnel and “on duty” reservists — died during some form of training and exercise from January 2000 through February 2018. The U.K. has 153,700 regular personnel and 81,850 reservists. When the U.S.–U.K. numbers are compared on an annual rate of training fatalities — factoring in the vastly different sizes of the two armed services — U.S. military training turns out to be 30 percent more lethal than the U.K. version. The main American themes for reducing noncombat fatalities center on readiness and reliable, up-to-date equipment, especially aircraft. To meet those goals, the NDAA is recommending more funding in the 2019 budget to ensure both enlisted troops and their machinery are up to the task at hand.